The arena lights were shining down bright as exhibitors lined-up their cattle in preparation for the coveted champion “slap.” Once the judge made his lap around the cattle to evaluate each steer for the last time, he slapped the champion, then it was 15-year old, Ethan Drager’s turn. He and his steer, Ranger, were named Reserve Grand Champion of the Junior Market Steer Show at the Houston Livestock Show and Rodeo. This was, literally, not his first rodeo. Ethan has participated in showing at the Houston Livestock Show and Rodeo for five years now, and has been showing steers for eight. 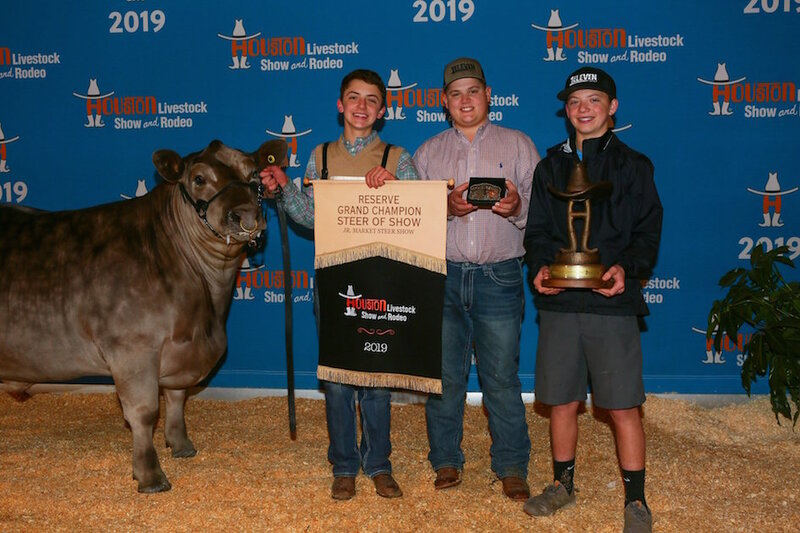 This year, Ethan showed Ranger at both the West Texas Fair in Abilene and the Wise County Youth Fair in Decatur, which is where his impressive steer also won Reserve Grand Champion. After winning Reserve Grand Champion, Ethan sold his slick-coated steer for a whopping $367,000 during the HLSR sale of champions. The Champagne Cowgirls, which purchased last year’s grand champion steer at the HLSR, bought the nearly 1,400 pound animal. Of the $367,000, Ethan gets to take home $40,000. The remaining balance gets put toward a scholarship fund which will be divvied up among other youth livestock competitors. $40,000 of the prize is guaranteed for Ethan take home, and $327,000 will contribute to a scholarship fund for youth involved livestock participations. With the $40,000, Ethan says he wants to buy more cows, donate a portion to charity and then put the rest away in savings. Showing steers has always been a passion of Ethan’s because his father was also involved in livestock showing when he was younger. Ethan’s family runs 1 Eleven Cattle Company in Bridgeport, where they specialize in raising show cattle. Ethan has already started the preparation process for showing steers next year, but when he isn’t in school or taking care of cattle, Ethan loves hunting and fishing. He’s an active member of the Wise County 4-H Club, part of the National Honor Society, serves as an officer in his FFA chapter and is a member of the NRS Show Team. In 2018, NRS established a program to help youth interested in agriculture pursue their future in the livestock industry. The NRS Show Team is composed of 25 high schoolers in grade levels 10th-12th. Members apply from all over Texas, and all have at least one year of showing experience. Ethan became involved with the NRS Show Team after his mom saw a Facebook advertisement last year during the application process. Needless to say, he applied, made the team and says it’s been a great experience so far. Show team members are given scholarship opportunities, educational opportunities and networking experience, all while being a part of a supportive community. “In a world full of technology, we want to keep our members grounded in the importance of life’s fuels such as responsibility and relationships,” said Amber Moenning, NRS Show Team Manager. To read more about the NRS Show Team and get to know a little more about this year’s members, visit the show team webpage. Let NRS help you prepare your livestock for your next show with the best products and supplies. Click here to shop our grooming and show supplies online.